Join the Simpsons family as they go on their theme park adventure to Krustyland. This motion simulator ride is chalked full of characters straight from the show and generous portions of Simpsons humor–enough to make re-rides very entertaining. 2 out of 5. Straightforward simulator ride. 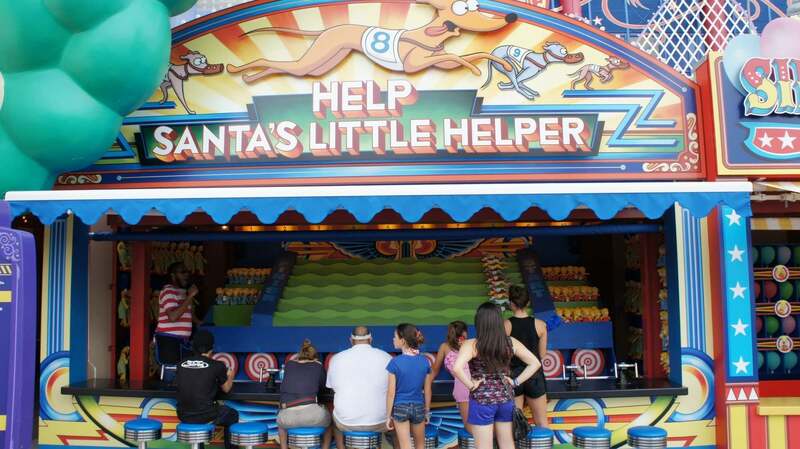 This attraction may be based on an animated show, but if you have seen the Simpsons on FOX, then you know their humor and story themes are adult-oriented. Expect the same on this ride. In homage to the Back To The Future Ride, which The Simpsons Ride replaced, Comic Book Guy is wearing Marty’s futuristic jacket from Back to the Future Part II. Creator Matt Groening can also be seen in a portrait on display in the queue sequence. 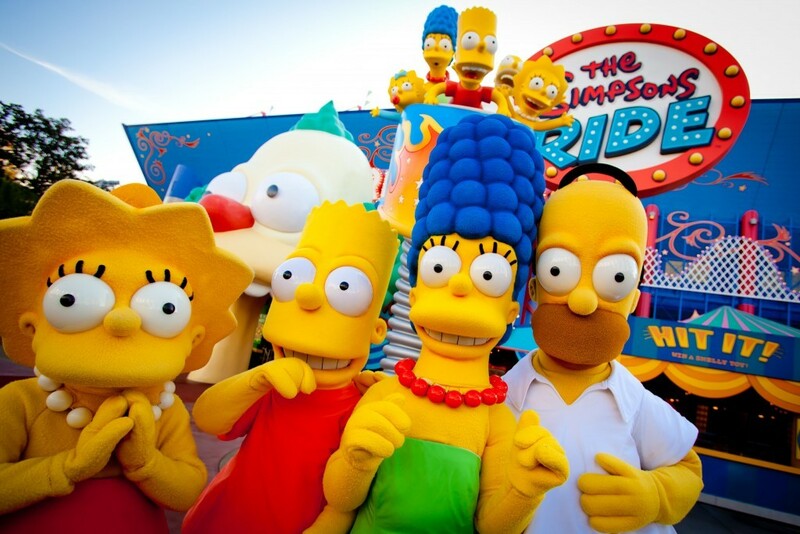 At the end of summer 2012 construction began on the facade of The Simpsons Ride, and in early October new carnival games were revealed. Here, at the entrance to The Simpsons Ride, these games fit perfectly, as this attraction is based on the new Krustyland theme park. 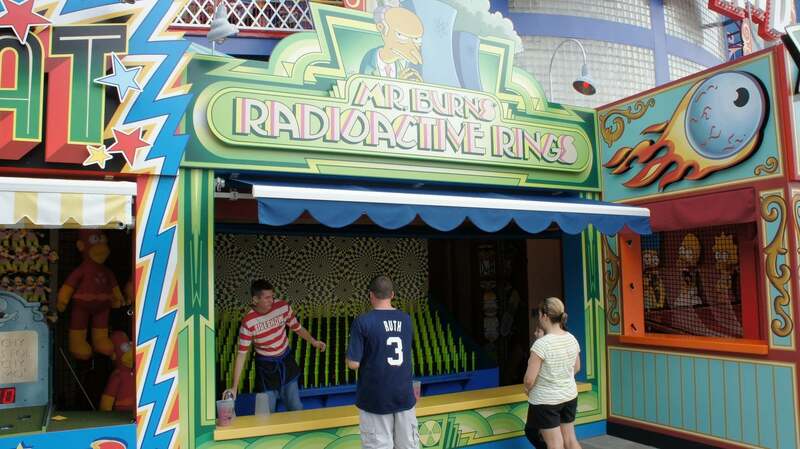 Carnival games in front of The Simpsons Ride at Universal Studios Florida. The entire experience is something no Simpson fan should miss, even my wife who doesn't care for the show loved the ride! The whole thing including the line Que is apart of the experience and something I highly recommend! I've got to say I was not a fan of this ride, and neither were my husband or best friend. The queue is amazing and perfectly themed. The ride itself though is super jerky and not smooth at all. With about 5 of these style rides around the theme park, I'd much rather do Transformers or Gringotts as they are a much smoother ride. Last time we did this one, I left with a bad headache and my husband with a sore back. We ALL loved this ride. Not only was the design and ride differeant from the others it REALLY made it fun for all our family. So much so we spent hours in this area of the park....after all we are all kids at heart. The ride itself is good to say the least. The problem I had was that it was way too much going on in the screen in front of you. I actually started to feel a little sick. Thankfully the ride ended and I had absolutely no problems in tge actual ride. The theming of the land itself is awesome! But be prepared for too much going on in the screen teen feet away from your face.